Patrick updated the task description for T90: Whonix Tor Controller. Patrick added a comment to T90: Whonix Tor Controller. work going back and forth together with them. I am fine with the split. Sure, let's make the code simpler and maintainable. Perhaps, in bridge mode, we could always add the following two options? since the choice for custom bridges will be given. HulaHoop added a comment to T90: Whonix Tor Controller. Perhaps Whonix Setup Wizard -> Whonix Connection Wizard? No. Keeping it super simple. I'm not sure where the disclaimer pages fit in that scheme. goldstein added a comment to T90: Whonix Tor Controller. Its a minority use case but very important IMO for high risk users who need to avoid guard fingerprinting. Please keep the Disable Tor option. Its a minority use case but very important IMO for high risk users who need to avoid guard fingerprinting. why would you disable Tor when you have just started the Whonix VM to Route your traffic trough tor ? I am not sure if we should keep the "disable Tor" option? A note about T118. Been on and off on that one. It looks like tor-launcher is merely settings variables, and that the actual work (like editing torrc or starting meek-client) is done downstream, in firefox or wherever. 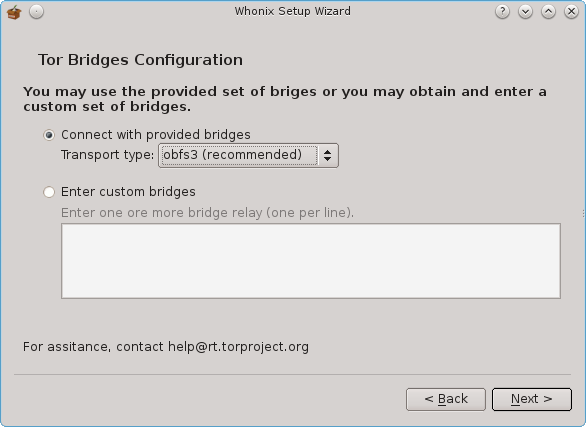 So I'm not sure it's even possible achieve the bridges settings that way, without starting Tor browser.